The Pipestoppers® Division of Huntingdon Fusion Techniques HFT® now design and manufacture a range of low cost, lightweight Inflatable Stoppers, available for pipes up to 120-inch diameter to prevent the entry of debris into pipes. HFT®’s Inflatable Stoppers are available in Cylindrical and Spherical formats. For straight pipes the Cylindrical Stoppers are recommended, whereas, for bends, the Spherical versions are more appropriate. Where there are fluids inside pipes that need to be retained by a stopper, it is usual to use plugs made of aluminium, steel or rubber. In cases where the fluid is aggressive, nitrile, silicon or Viton rubbers can replace the standard natural rubber seals. PetroChem™ Inflatable Stoppers are also available for petrochemical duties by using a protective cover over the inflatable section. For larger diameter pipes, Aluminium Stoppers are manufactured up to 36-inch diameter, and Steel Plugs up to 72-inch diameter. 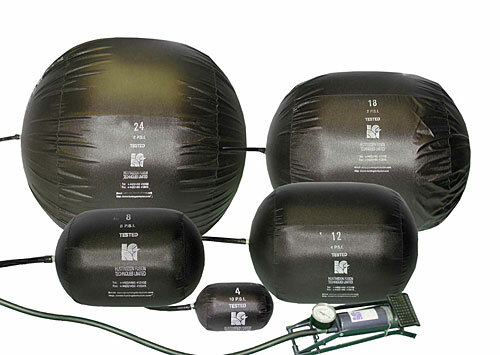 After that it is necessary to consider Inflatable Stoppers that are available up to 120-inch diameter and greater.